The BEST Dominican Potato Salad recipe - "Ensalada Rusa"
Potato salad, what’s so special about it? Nothing in particular, but to me food isn’t only about the flavors, it’s about the memories it provokes in you. And that’s why this Dominican Potato Salad is so special to me – read more to find out why. Potato salad – everyone has a favorite and this is mine. Five ingredients, nothing fancy. Potatoes, carrots, eggs, vinegar, and mayonnaise, with a healthy dose of salt, make up this recipe. I would choose this over any foie gras dish, any day. I would choose this over basically nay other dish in the entire world. It’s on my “if I die tomorrow” menu. That’s how good this Dominican Potato Salad is – and now I’m sharing my mom’s recipe and technique with you to make at home! 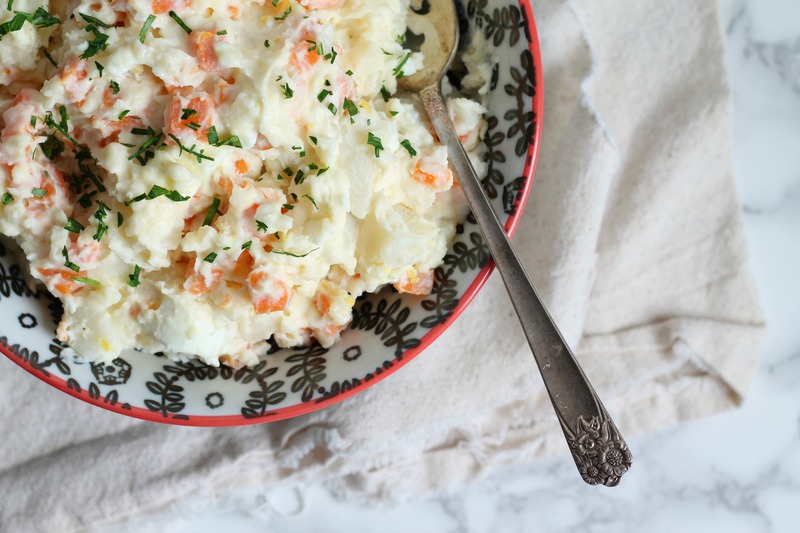 This potato salad graces Dominican tables all year long – whether it’s a weekday lunch (our lunches are typically a few courses, unlike regular American lunches which are quite simple) or at the holiday table, potato salad is a side dish that can’t be missed. I learned this recipe from my mother, who learned it from her mother (my Yaya, who I love and talk to on the phone almost daily!) It was something we always made for special family dinners and it’s still the recipe I come home to when I visit my parents in the Dominican Republic. It’s quite simple: you peel and boil the potatoes and carrots until tender. I’ve seen cooks boil the eggs as well with these, but I tend to prefer to cook my eggs separately so they don’t over cook. Once cooked, toss with seasonings, and add the dressing. Toss to coat and chill until ready to serve. I’ve seen and made this salad made over hundreds of time, so here are my top tips (which are really my mom’s tips, which are actually my Yaya’s tips)! Cook the carrots and potatoes in the same pot – just cut the carrots a bit smaller so they cook at the same rate as the potatoes! Season the potatoes and carrots AS SOON AS you drain them and while they are HOT – lay them out on a sheet tray or large bowl and douse with vinegar and salt – the end result is 100% better than if you seasoned them while cold. To achieve best texture, when making the potato salad – use a table knife to stir and mix. Use a cutting motion to cut through potatoes easily and creating a creamy potato salad. Taste when done and re-season with salt, pepper, and more vinegar if needed. You can use almost any kind of vinegar except balsamic – red wine vinegar, white wine vinegar, distilled vinegar, apple cider vinegar – they all are great! One taste of this Dominican Potato Salad and you'll be hooked! Start by setting up a large pot with water and salt - bring to a boil. Cook the potatoes and carrots until tender, drain and lay on sheet tray. Instantly drizzle with vinegar and salt, let cool. Cook the eggs to hard boil - start eggs in cold water, bring to a boil, turn heat off, cover and set timer for 12 minutes and you have perfect eggs! Chop the eggs and chill. Combine the potatoes, carrots, and eggs with mayonnaise, taste to re-season. You might need to add more vinegar and salt depending on your preferences. Chill for an hour or more, serve cold. This is so very close to the Russian potato salad! Interesting idea on using the knife to mix the salad.